Much like the dolphin, I gave this pattern a 2/10 stars. It would be perfect for a sewist that’s only made a few plushies before. And if you left off the spiral horn and made it into a regular whale it’s even easier! Categories: Free Projects, Plushies | Tags: cute, diy, free, how to, kawaii, narwhal, pattern, plush, plushie, project, sea, sewing, stuffed animal, tutorial, unicorn, whale | Permalink. It was free to the first 50 people to download ♥ So I hope you all enjoy your copies! But for everyone else I’ll be offering it at 50% off for the first week as part of the launch special. I hope you’ll give it a look! Categories: Shop, Updates | Tags: clara, creature, cute, diy, how to, jellyfish, kawaii, pattern, princess, project, sea, sewing, tutorial | Permalink. New Crafting Challenge Pattern for April! I hope you all had a great March! Spring is finally in full swing where I am, which is a little unfortunate because cold weather is hard to come by in Florida. I’ve been chugging along this month creating more patterns and tutorials. I feel like I’m really on a roll, lately! I feel like these little cuties hardly need an introduction; I’m sure you all know about the legendary sea monster that hails from the famous lake in Scotland. How could I even dream of doing a year of legendary creatures without including ol’ Nessie, right? 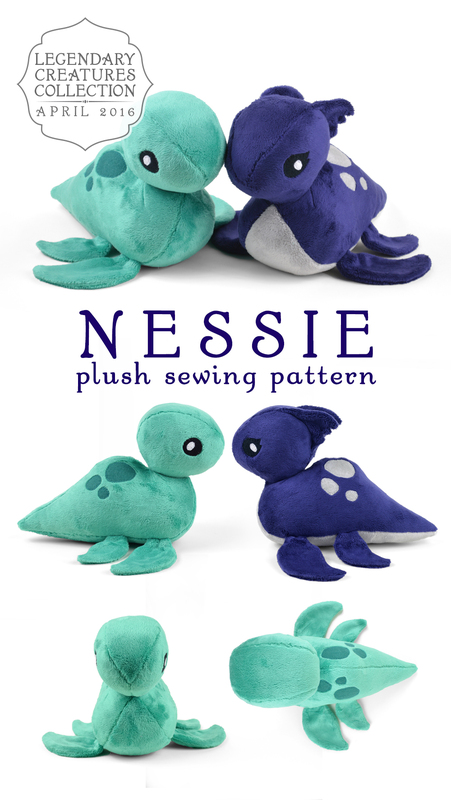 I spent a lot of time perfecting her, since lots of other awesome pattern designers have made their own versions of Nessie and I wanted to be sure mine looked different 🙂 So my Nessie is a good deal tinier and chubbier. Shown is the classic Nessie in sea green and an alternate one with lashed eyes, a contrast belly, and head fins for that little something special. The one down side to this little girlie is she’s a bit more difficult than other plush patterns I’ve done before. I’ve given it a 5/10. Technically she’s the first pattern I’ve done with a gusset. If you’ve done plushies with gussets before it shouldn’t be too intimidating. If you think you’re ready to try them out, I go through the process very slowly, so with any luck maybe this pattern will help you pick up a new skill! I do think that if you wanted to make the process easier, you could enlarge the pattern 150% or 200% so the seam allowances are larger and it’s easier to be accurate. I’ll see about making up a larger version to show you guys how it might look! If you’re NEW to this site, this pattern is my one time only FREE gift to you! Just submit your email address to subscribe to my blog between now and April 30th (found in the submission box on the right sidebar above “My Books”). This will earn you the pattern ONE TIME for THIS MONTH ONLY. Categories: Monthly Crafting Challenge | Tags: animal, challenge, craft, creature, cute, free, gift, kawaii, loch, monster, ness, Nessie, pattern, plush, sea, sewing, soft, stuffed, update | Permalink. Probably even more obscure than some of the other nerdy holidays I’ve been celebrating, today is International Steampunk Day! I can’t seem to find why today in particular is Steampunk Day, as some have claimed that today is H.G. Wells’ birthday – though it’s not – but there you have it! I sorted through all of my scraps to and put together the best I could with what I have. At the moment I don’t have a lot of hardware, which you must admit can really help the look of a steampunk item, so I did the best with what I had and looked to some leftover turn-lock closures to make this next project. 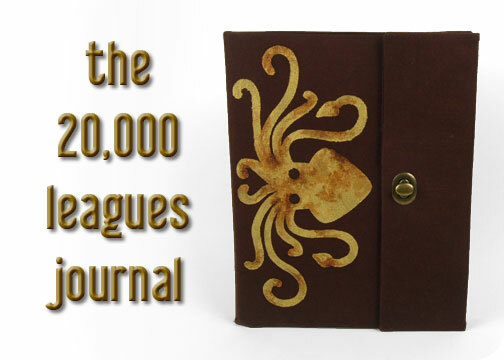 I started thinking of some of my favorite Jules Verne books and thought a journal cover with a giant squid a la 20,000 Leagues Under the Sea would be a nice fit ^-^ It’s not exactly scientific, but it’s sure adventurous! 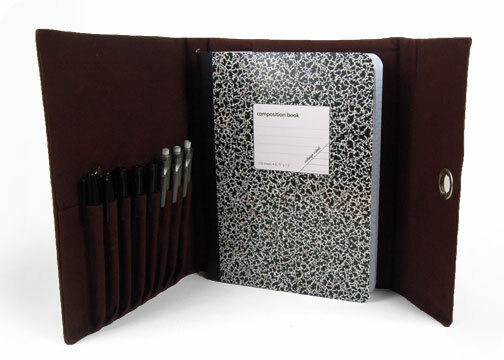 It’s sized to fit a standard composition book, so you can continually switch out the book once you’ve filled it up with all your epic stories and start fresh! On top of that, there are 8 pencil slots so you could also sketch to your heart’s content as well ^w^! Categories: Free Projects, Nerdiness, Stationery | Tags: 000, 20, adventure, carryall, case, cover, diy, free, how to, journal, jules, leagues, pattern, pencil, pocket, project, punk, sea, sewing, sketch, squid, steam, steampunk, under, verne, Victorian | Permalink. Another month has passed, and it feels like a lot has been accomplished! I have nearly 20 free patterns in my stash of sewing tutorials, with many more exciting ones to come! And I also now have over 75 subscribers! So I want to thank you all out there who are following me and my work. Your kind messages and encouragement really help me keep going! Since it’s the first of the month, that means it’s time for the next leg of my Monthly Crafting Challenge! 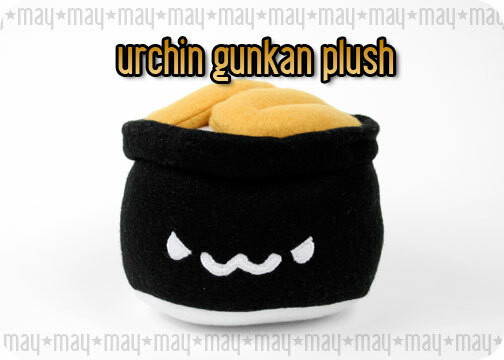 The freebie for the month of May is an angry-looking little Urchin Gunkan Sushi Plush! This one is very similar to the Ikura Gunkan plush from February, except with an urchin (also called uni) filling. Sea urchin is a delicacy in many parts of the world that are near the ocean, but the taste is something that many people debate x3 Some find it tastes horribly funky and like dirty ocean water, while others claim it’s sweet and nutty. It’s one of those foods that can differ greatly depending on the quality and freshness of the product, so keep that in mind if you have the guts to try it! Just like the Ikura Gunkan, this sushi emulates a mound of rice, topped with the sushi filling (two pieces of sea urchin), and then wrapped in a sheet of nori to keep it all together. If you haven’t signed up for emails yet, you can get this little guy along with the freebie for April today only, and after today the prize is just this guy 🙂 Just sign up with the entry box on the side of the screen and I’ll send you the pattern! So that’s the end of April, it seems 😀 With any luck May will be just as exciting and productive! Categories: 2013 Collection, Monthly Crafting Challenge, Updates | Tags: animal, challenge, craft, cute, fish, free, gift, gunkan, kawaii, pattern, plush, rice, sea, sewing, soft, stuffed, sushi, uni, update, urchin | Permalink.